Use your mouse to scratch off the area below to get your coupon code! • The loft and material of a pillow determine the comfort, support of the head, neck, and shoulders, and the relaxation that is experienced during sleep. • This washable pillow that gently cradles the head with soothing support helps maintain the spine in its natural position for a more tension-releasing sleep. • The thoughtfully designed quilted outer-case partners with the “woolly puffs” creating the sensation of muscles relaxing, joints releasing tension. 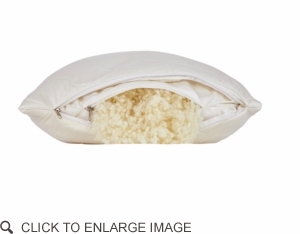 • The generous amount of “woolly puffs” in the pillow may be removed from the inner case achieving the desired loft. Optimal comfort and relaxation is sweetly accomplished. • Eliminate the overheating and night sweats common with down, feather and synthetic fills and foam. • Sleep well and healthy. • Comes with 100% natural wool filled quilted pillow case for a long term care and superior sleep comfort. • Encased in 100% natural cotton sateen, 300TC. • Filled with Woolly Puffs™, pearl sized puffs of soft and springy 100% natural Shropshire wool.